My son loves Larry-Boy so for his second birthday I decided to give it a try seeing as I always make a childrens cake for their birthdays. I baked a large chocolate sheet cake from scratch (‘crazy cake’) and cut a large oval from it. With the left over edges I built Larry-Boy up in the centre to give him a 3D look. I used the left-over corners for his suction-cup ears. A tiny piece of cake was rounded off for his nose. I used a TimTam chocolate biscuit and part of a wagon-wheel biscuit for the top of his helmet and half-biscuits for the insides of his suction cups. All the pieces were coated and stuck together with chocolate buttercream. I then colored sugar paste (fondant) yellow, orange, purple and green and covered the cake starting with his face then his shirt, his helmet and pants. I cut his eyes and collars from white sugar paste and used licorice for his belt and pupils. This was quite easy to cut with scissors and attached with sugar glue. I was happy with the final product but the real joy was seeing the look on my son’s face! 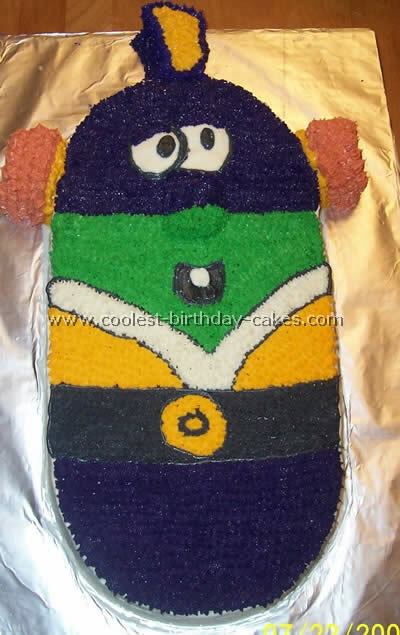 This is a childrens cake made using a rectangle pan and a round pan. I also made a few cupcakes to use for the plunger ears. A friend had asked if I could do a Larry boy cake and since there are no Larry boys’ pans to buy I decided I could pull it off freehand. The body is a rectangle pan; the top and bottom are halves of a 9" circle cake. I did all of the icing designs using my imagination and just hoped it would all come together and it did! The plugger ears were the hardest, it’s a combo of a cupcake and leftover cake from what I cut off to make the cucumber shape fit with the round halves. I used toothpicks to get the cake to stay in place then iced around it using star shapes. There are several layers of stars to make it seem more 3D. The icing is homemade buttercream. The cake is just a Betty Crocker golden yellow. My son loves Larry Boy. I thought that would be perfect for his birthday so I decided to try to make a Larry Boy cake since Larry boy is a good shape for a childrens cake. I took a glass and cut out a nose. I cut out a piece from the scraps left over for the helmet. I used white frosting and colored it myself with food coloring. I used a tube of black for the belt and eyes. I piped his eyes and eyelids on with a small plastic bag that I cut the tip off of. I used this method to pipe the yellow on his helmet. I found it easy to assemble his body then frost from the bottom up. I also used chocolate for the body and vanilla for the head and bottom so everybody was satisfied. It was a big hit. It takes a little less than an hour to assemble and frost carefully. I was inspired from a childrens cake on this site. Thanks! 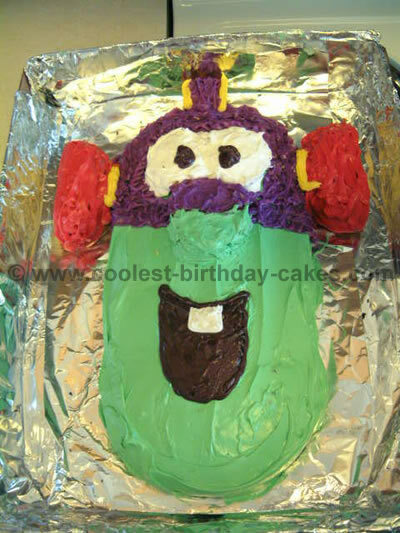 I saw a childrens cake very similar to this on this website and thought I’d try making it for my nephew’s 2nd birthday. He loves veggie tales and was ecstatic. 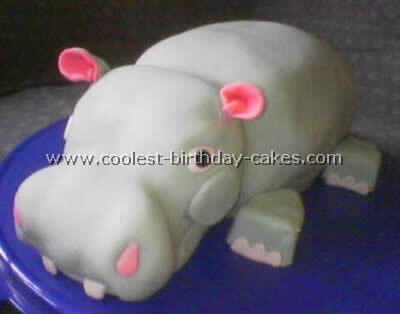 Wasn’t difficult at all and I didn’t use any molds…just a flat 9 x 12 cake pan and did the rest by hand with icing. It was really fun! 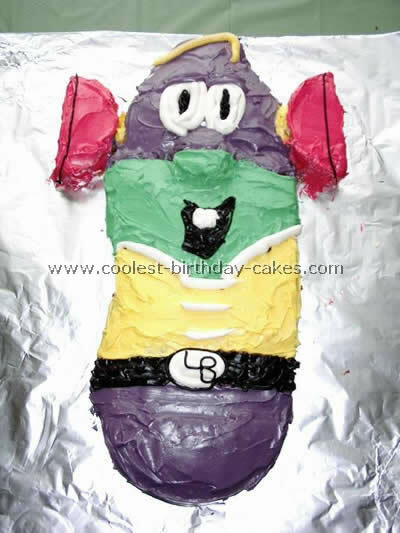 This LarryBoy childrens cake is made with 2 boxes of cake mix. I used one 8" square cake pan, one 8" round cake pan, and two 2" round cake pans. I cut the 8" round cake in half and put one on each end of the square and used the 2" round pans for the ears. His eyes are made from one marshmallow cut in half and 1/3 of a marshmallow for the nose. I used a picture I got online as well as my niece and nephews artwork. 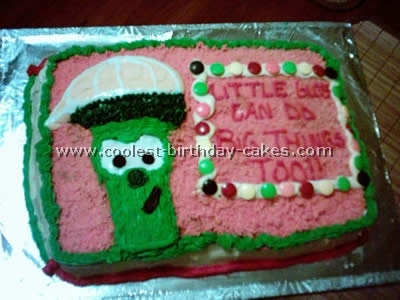 This is a cupcake Veggie Tale childrens cake. I placed approximately 20 cupcakes in a square then iced right across the top of all of them using buttercream. I then did Larry and the saying using edible rice/wafer paper that I had traced the outline and saying with food coloring markers (got both from cake decorating supply store). 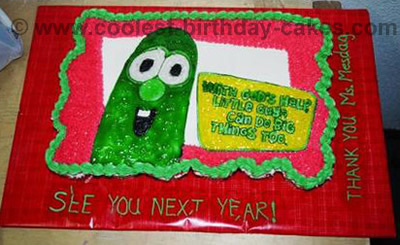 I used green piping gel for Larry and piping gel for the saying as well. Then I added a red border with buttercream using a star tip. If you use the wafer paper like I did, you either need to cut each cupcake with a knife or slide them out from under the wafer paper (which is what we did). 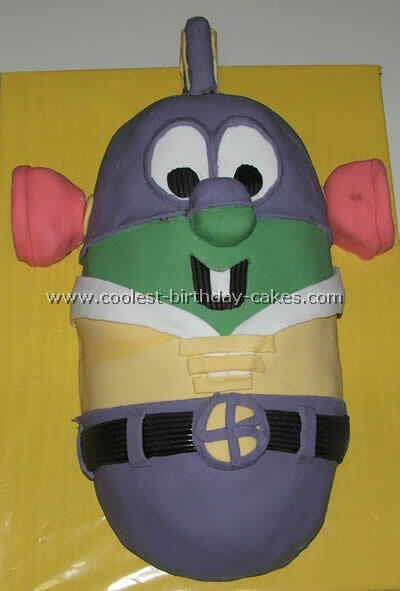 My son was obsessed with Larry Boy, the hero based on the Veggie Tale series. For this childrens cake, I used two cake mixes and baked one 9×13 inch cake with one. I then used one 9-inch round, one medium glass bowl and one small glass bowl with the other mix. 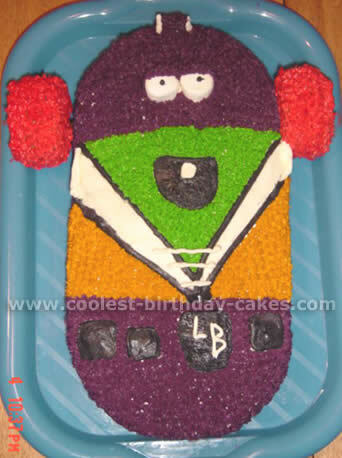 I placed the 9×13 inch cake as Larry’s torso and divided the 9-inch round in half for his head and bottom. The medium glass bowl cake was split to become his "plunger ears" and the small glass bowl cake was rounded a bit with a knife and used for his nose. The icing was the tubes of colored icing but now that I know about the color pastes, I’d go with a homemade icing that I colored myself. I actually made two of these cakes (one for our house party and one for school)! Chase LOVED both of them and the kids were very excited about it.